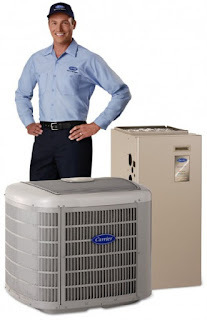 Sandium Heating and Air Blog: Carrier Air Conditioning- Is It Right For You? Carrier Air Conditioning- Is It Right For You? Air conditioners are a must for anyone living in a warm climate. As soon as the temperatures start rising, the air conditioning better be in condition or else tempers may flair. To be prepared for the warm seasons, make sure you have your air conditioning checked by a profession and make sure you have a good air conditioning unit. Sadly, these units do not last forever and will need replacement. When it comes to replacement, you may wonder which brand is best to purchase and who to select for installation. There are several brands on the market--Carrier, Lennox, Trane, etc. Each have their good and bad selling points, as any product has. When selecting an air conditioner, it's important to read reviews and see what others are saying. Let's say you select Carrier as the unit you want to purchase. Begin reading reviews about Carrier and see how well the unit works, especially the model you are considering, and research what people say about the product. You will find useful information all around you if you search. Carrier units work great for some people and don't get the job done for others. Observe what the person is writing about and look for specifics. Note when a person is speaking about their desires and needs and when they are being more objective and talking about the unit. Some may complain that a Carrier unit is too cold, but you may enjoy that part of the unit. So, observe what is being said and make sure it's not a personal complaint, but a true complaint about the system. As many have reported, the main problem with any unit, whether it's Carrier or not, is that bad installation will make a good unit become a horrible unit. It depends on who installs the unit and how good of a job they perform. So, it is equally important to search and read reviews of installation companies and make sure that your Carrier unit is installed properly. You can purchase the best unit on the market and have it installed incorrect, and be out of luck. It all depends on the installation. It's time to begin your search. Ask your friends and family members what units they have at their house or apartment and start from there. Or select a brand like Carrier and begin searching through their models and begin reading reviews to see if they are a quality brand.